When designing a work environment, an important factor to be considered is ergonomics; it is perhaps best described as a discipline dealing with the interaction between human beings and surrounding elements. Its main goal is to come up with tools and components such as the best ergonomic chairs that are functionally optimized for human users in order to improve comfort, effectiveness, and efficiency. With ergonomics implemented, users work better because the surrounding environment was built to meet specific work needs. For example, workers at an office space designed with ergonomics that includes ergonomic chairs, keyboards, monitors, and work desks will benefit from such an environment as everything is built according to user specifications. The table size should be the size for the amount of work, table height should match a user’s body height, and the chair should provide the right elevation that is needed. Not all furnishings are built with ergonomics in mind. For example, many chairs are not designed specifically for user comfort. A stool can hold a worker yet will not as comfortable or appropriate as an office desk chair. Poor ergonomics from products such as stools can cause many user problems as shown below. When poorly designed office furniture is chosen, health issues and work inefficiency can result from such a selection. Health Issues – Using equipment with poor ergonomics can lead to health issues. The body is designed to be adaptive and conform to various conditions; however, this can only be done for a limited amount of time before leading to discomfort or more serious problems. For example, sitting on a hard chair can be tolerable for a certain amount of time; when used for an entire day’s work, it can lead to buttocks pain and even skin irritation. The same outcome can be expected with other poorly designed furniture that is used for a long period of time; poor ergonomics often leads to health issues in the muscular-skeletal system. When the body remains in an uncomfortable posture, muscles are improperly used, tendons are stretched and nerves are pressed, leading to discomfort, pain, and even permanent injury. Work Inefficiency – Components that are not built according to a user’s specifications can disrupt work and cause inefficiency. A work desk that is too high may still serve its purpose; however, it will harder to work with than one set at the right height. A worker will have to exert more effort which can slow down assigned duties; time is spent repositioning to reach everything on the desk, consuming valuable work time. A four-legged office chair may function unless a user has to constantly turn sideways to get things, in which case the chair becomes disruptive to such movements and requires extra effort and time to leave the chair to complete tasks. On the other hand, if the best ergonomic chairs are used with a rotatable support and casters, a user can then conveniently move around a work station. Ergonomic furnishings are an important design consideration when setting up an office. Failure to recognize such importance can lead to work inefficiency and even increase worker health issues. To avoid such undesired negative consequences, be sure to invest in furniture that helps rather than hinder the work process! 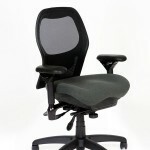 The Ergonomic Chairs Store Has the Best Ergonomic Chairs For Your Office! Are you experiencing discomfort from the furnishings in your office? Call Ergonomics Chairs Store at 979-217-3044 to take a look at the ergonomic chairs they have to offer – and improve the quality of your work life!